Developed exclusively for Roland inkjet printers and printer/cutters, VersaWorks RIP software ensures exceptional production output with unmatched ease of use. Based on the latest Adobe CPSI 3019 engine, VersaWorks includes advanced error diffusion, 16-bit rendering and the Roland Color system, which accurately reproduces more than 1,000 standard colors and 512 metallic colors. A spot color replacement feature is included as well, allowing you to automatically replace a spot color with any option from within Roland Color without reopening the file in graphics editing software. VersaWorks also features a built-in PANTONE® library which automatically converts specific PANTONE spot colors in your design file to a CMYK value. Roland inkjets combine unbeatable performance with legendary Roland reliability. 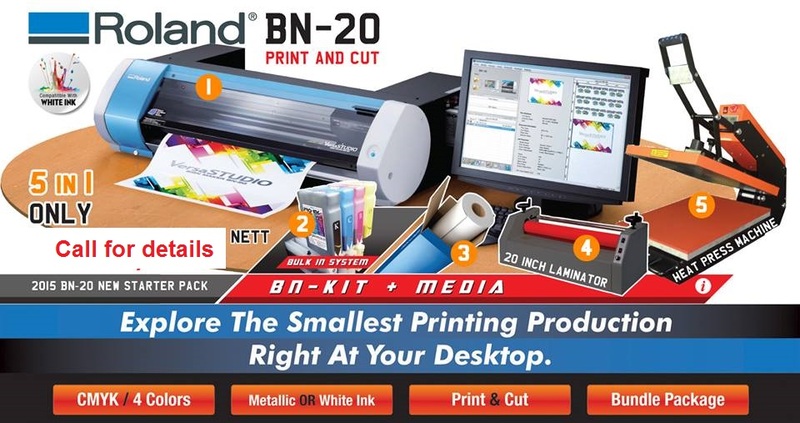 As proof, The VersaStudio BN-20 is warranted for a period of one year, For more information about the standard and extended warranties, please contact Image Junction Sdn Bhd.. Distance accuracy (when printing) (*2)(*3) Error of less than ± 0.3 % of distance traveled, or ± 0.3mm (0.012 in), whichever is greater. Distance accuracy (when cutting) (*2)(*4) Error of less than ± 0.4 % of distance traveled, or ± 0.3mm (0.012 in), whichever is greater.